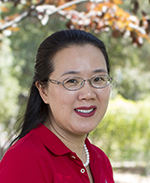 Weiqing Gu has been named the inaugural McAlister Professor of Mathematics at Harvey Mudd College. Established in 2018 by longtime supporters Robert and Barbara McAlister to recognize and support the work of an outstanding faculty member within the Department of Mathematics, the appointment includes an annual discretionary fund to support travel, research or teaching. Gu, who is also director of the Harvey Mudd College Mathematics Clinic, joined the Harvey Mudd faculty in July 1996, immediately after she earned her PhD in mathematics and two master’s degrees, one in math and the other in computer science, all from the University of Pennsylvania. She specializes in differential geometry and topology, with applications to big data analysis, computer-aided design and robotics. Her research on the geometry of a manifold (e.g., a sphere or a Grassmann manifold) and in computational geometry directly applies to big data-to-decision, fundamental problems in dynamics, control theory, robotics and computer graphics. Gu also researches applications to math-biology and applications to industrial mathematics including optimal control, encryption and color scheme. “I’m delighted to join with the mathematics department in honoring Weiqing who is not only a preeminent scholar in her field but also someone who has brought her considerable enthusiasm into the classroom and into her role as Clinic director for her department,” says Lisa Sullivan, vice president and R. Michael Shanahan Dean of the Faculty. During this academic year, Gu has published several papers with her students highlighting their research on applying advanced mathematics to big data analytics and developing new algorithms for machine learning and artificial intelligence. This summer, she will teach Nonlinear Data Analytics during HMC’s Summer Session and will conduct research with Matthew LeMay ’21 and Ricky Shapley ’20, the 2019 HMC Giovanni Borrelli Fellow. Gu is developing two new courses (Advanced Data Analysis with Applications in Solving Real World Problems and Nonlinear Data Analysis with Applications in AI) and has been updating the Mathematics of Big Data course she developed in 2016. “I have been trying my best to meet our students’ need for data analysis, recording these needs and gradually turning them to new data science courses,” she says. Endowed faculty positions—chairs, professorships and fellowships—are among the top priorities for the College. These positions allow HMC to attract, retain and celebrate its outstanding faculty. During its successful, comprehensive fundraising effort, The Campaign for Harvey Mudd College, the College established 11 new professorships, one of which is the McAlister Professor of Mathematics. Posted in: Campaign, Faculty, Mathematics, Research, Students.